Hey everyone! 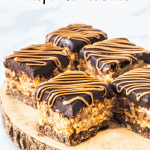 I’m here today with a recipe for my Vegan Caramel Rice Krispie Treat Bars! Ps. My vegan recipes are usually paleo as well, however this one is not, because of the rice crisps. Anyway, this recipe is still gluten-free, refined sugar free and all that good stuff. I was craving for Rice Krispie treats the other day. And I figured why not make them vegan Rice Krispie treats instead? And also, why stop at vegan Rice Krispie treats? 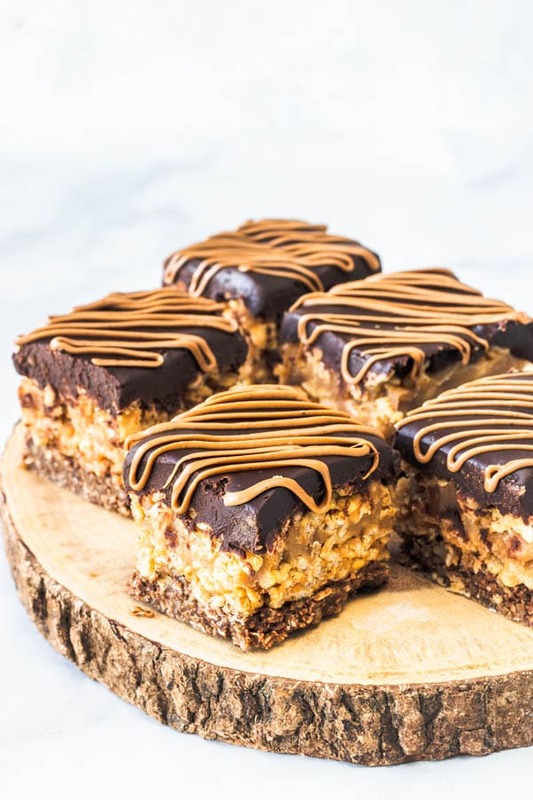 Why not make them into bars, with a crust, and a topping, or better yet, two toppings if you count the Vegan chocolate ganache, and the caramel drizzled on top. 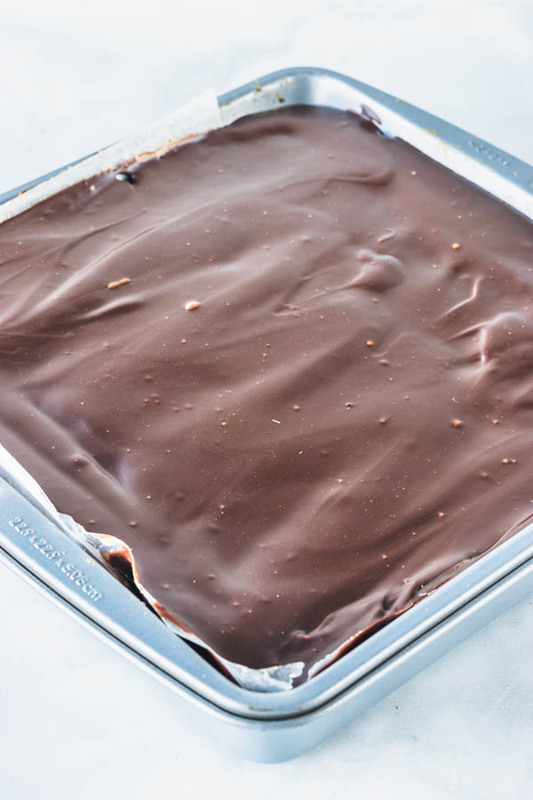 Making these bars is the easiest thing you’ll ever do. And I’ll tell you, if you really want to, you can keep them as treats, without a crust if you will. They will still be delicious. 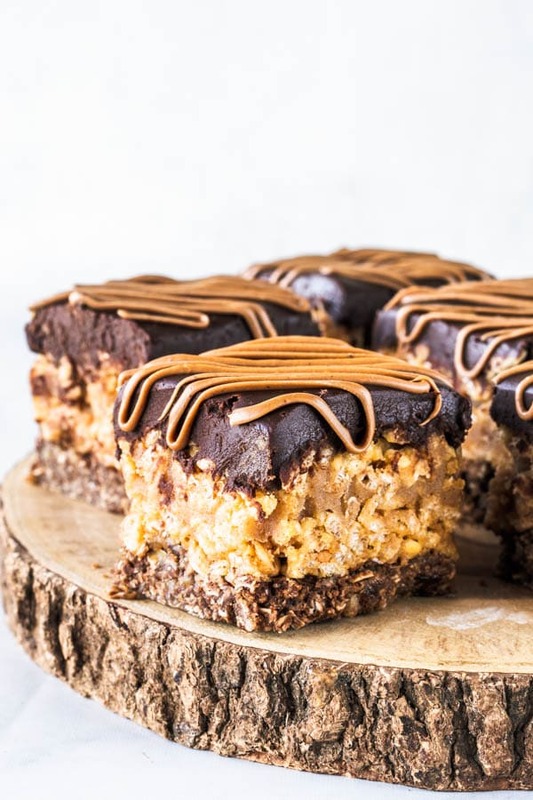 So let’s talk about how to make these Vegan Caramel Rice Krispie Treat Bars. As I said before, we star with a crust. A nutty crust. I used walnuts, but you’re more than welcome to use almonds, or pecans. Just make sure the mixture for the crust is clumping up together, to be able to hold. Add a bit more maple syrup to the crust ingredients if the mixture is not clumping up together. Anyway, let the crust rest in the fridge while you prepare the caramel and the vegan Rice Krispie treat filling. 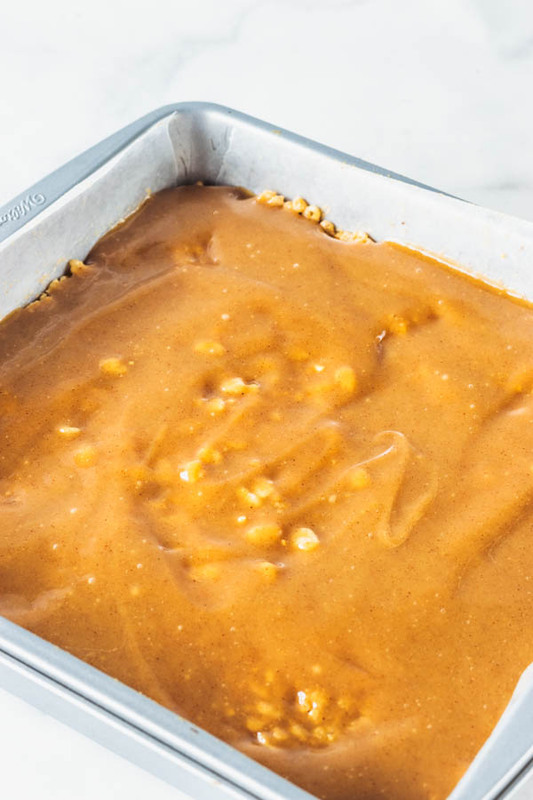 Before adding the filling to the pan, you may spread a thin layer of the caramel over the crust, to help the Rice Krispie treat layer stick to the crust a little better. Press half of the vegan Rice Krispie treats mixture over the crust. Use a sheet of wax paper to help you press the mixture down without sticking to your hands too much, because at this point, the mixture will be very sticky. 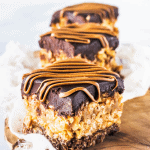 Now, you may spread the caramel over the layer of vegan Rice Krispie treat. And then, place the remaining Rice Krispie treat filling on top. And press that down too with the help of the wax paper. Finally, spread the ganache on top. Once mixture sets in the fridge after a few hours, you may take it out of the pan and slice it. And maybe drizzle some more caramel over the ganache too. I am really digging these vegan desserts lately. And if they come in the form of bars, with chocolate, then I am all in! Creating vegan desserts has been so much fun. A challenging and also delicious experience. 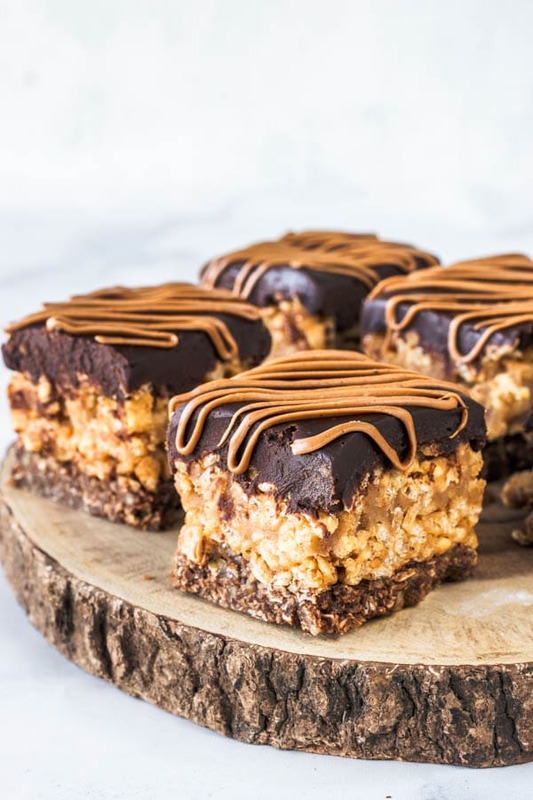 These Vegan Caramel Rice Krispie Treat Bars are to die for. If you want to check out some more of my vegan desserts, please click here. And I can tell you what my favorite ones are at the moment. Hazelnut Vegan Cupcakes, Vegan Matcha Cheesecake. 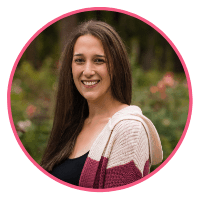 As always I thank you so much for your support to the blog, and for being here! You rock! 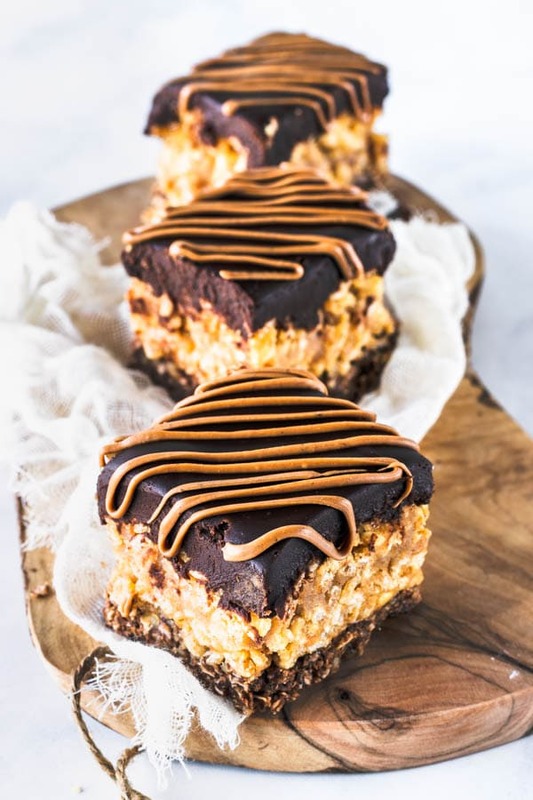 These Vegan Caramel Rice Krispie Treat Bars are covered with chocolate ganache, and feature a nutty crust. Process all ingredients in the food processor until completely incorporated. 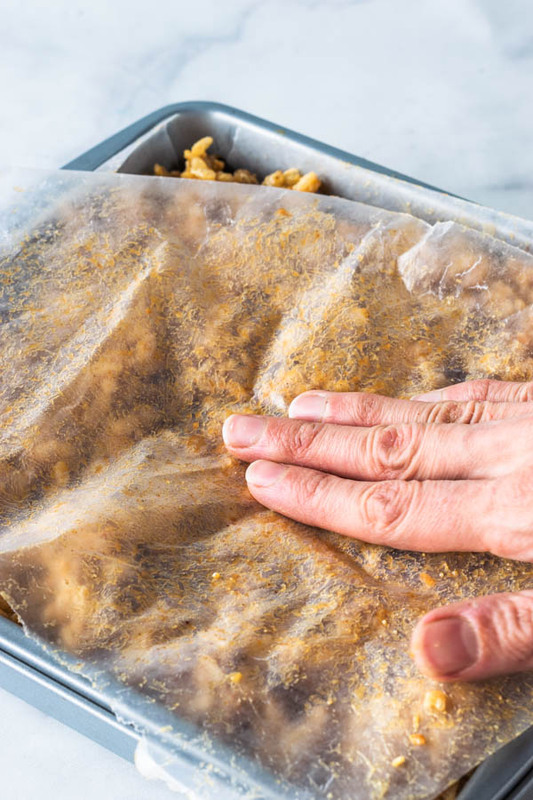 Press crust onto the bottom of a 8×8” pan lined with parchment paper. Combine all ingredients in a small saucepan. Bring mixture to a boil and simmer quickly until thickened and complete incorporated. Whisk nut butter with maple syrup and vanilla extract in a large bowl. If the nut butter is too solid and hardened, you may microwave the mixture for a few seconds to heat it up and make it easier to incorporate. Add brown rice crisp cereal to the bowl. Mix with a spatula until combined. Heat up the coconut cream in the microwave or in a small saucepan until very hot. Pour over chocolate chips. Stir with a spatula until completely smooth. If you still see pieces of chocolate in the ganache, simply place bowl in the microwave for a few seconds at a time until chocolate has melted completely. Remember not to overheat your chocolate. Spread a thin layer of caramel sauce on top of the crust. Press half of the rice krispie treat mixture on top. 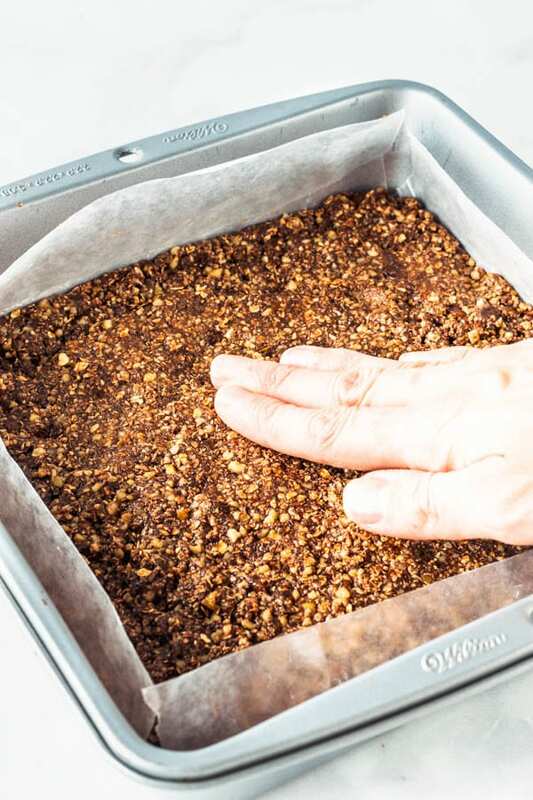 Use wax paper to help you manage the sticky rice krispie treats and press them down packed. Pour the remaining caramel over. Now press the other half of the rice krispie treat mixture on top of caramel. Pour ganache over rice krispie treats. Ganache should be at room temperature when you do this, neither warm, or cold. 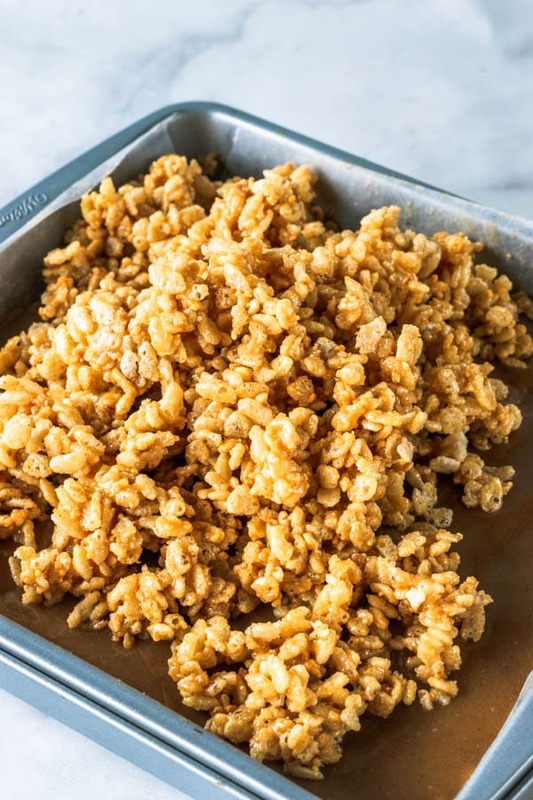 Let Rice Krispies rest in the fridge for a couple of hours before serving. The treats will store well in the fridge in an airtight container for up to 4 days. 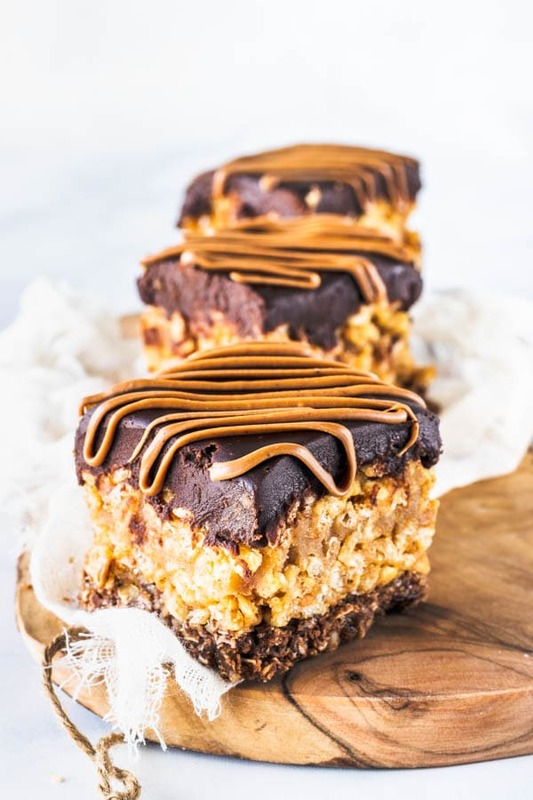 *Note, you may want to save some caramel from the filling part, or make extra to drizzle over chilled bars, once the ganache has set. These are on my must-make list Camila! 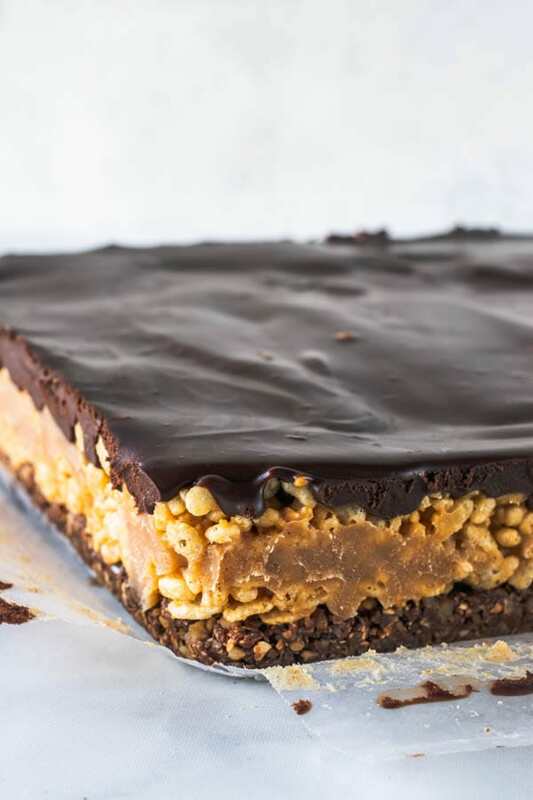 I have brown Rice Krispies in the cupboard that are just begging to be used in these treats!